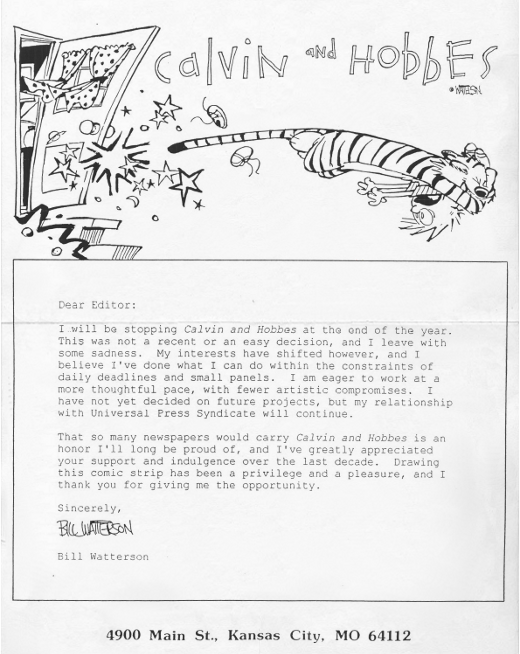 Late-1995, ten years after it was first syndicated, Bill Watterson sent the following letter to the thousands of newspapers which carried his widely-adored Calvin and Hobbes comic strip, in doing so announcing the forthcoming end of its run. True to his word, on December 31st of that year the final, 3'160th strip - seen above - appeared in publications around the world, and millions of hearts began to break. Many thanks to Kirsty for the letter. 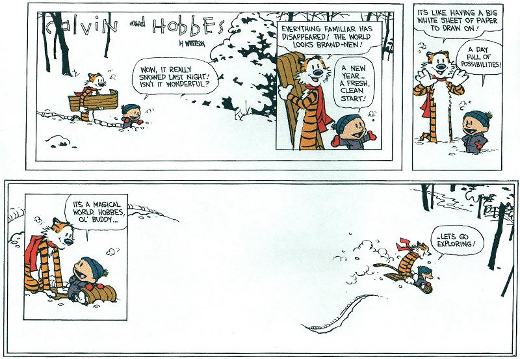 I will be stopping Calvin and Hobbes at the end of the year. This was not a recent or an easy decision, and I leave with some sadness. My interests have shifted however, and I believe I've done what I can do within the constraints of daily deadlines and small panels. I am eager to work at a more thoughtful pace, with fewer artistic compromises. I have not yet decided on future projects, but my relationship with Universal Press Syndicate will continue.